In this video, John Petrucci's guitar tech, Maddi Schieferstein, gives a rundown of the guitar rig that was used during Dream Theater's 2014 "Along for the Ride" tour. The Boss DC-2 can be seen at 3:15. According to photo from Daniel's Instagram page, Gallagher's board first included Boss DC-2 pedal and Catalinbread CSIDMAN, but those were later swapped out. "Looking forward to use this (-: #bossdimensionc #newpedal #trentefixion #fixion"
Posted on his Instagram feed. In this 2008 pedalboard photo (which is his pedalboard because it looks almost identical to his [2010 one](https://flic.kr/p/93aWUe)), the Boss DC-2 Dimension C can be seen. "On "Jackson," for example, the Dimension C is on one channel with a straight up ES-335 through a Marshall on the left channel." "My pedal board with The Cure is 50? x 25? because we are covering 30 years of sounds. Currently, on that board I go wah, Source Audio Multiwave Distortion; Tuner, MXR Phase 90, t.c. electronic Shaker Vibrato, t.c. electronic Vortex Flanger, Source Audio Filter, Source Audio Orbital Modulator, Electro-Harmonix Ravish Sitar with a Bearfoot Effects line booster to help the Ravish with level issues, Bearfoot Effects compressor, then Bearfoot Effects Honeybeast, Bearfoot Effects Model H, Creation Audio booster, then into stereo with Boss Dimension C pedal, Maxon chorus and flanger, into a modded Line 6 DL4, then into the big t.c. electronic Flashback delay, and a t.c. electronic Hall of Fame reverb." Pete speaks with *Paste* magazine about the pedals he uses. The Boss Dimension C is one of the pedals mentioned. 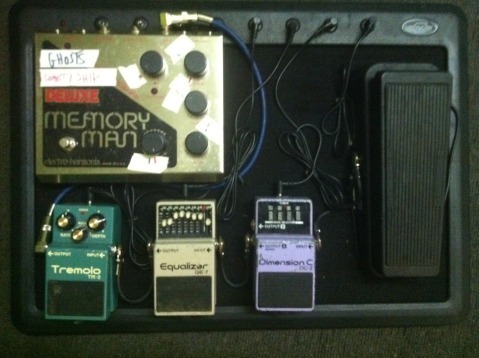 [Source](http://www.pastemagazine.com/blogs/lists/2012/05/14-guitarists-talk-about-their-pedal-boards.html). According to [Guitar Geek](http://www.guitargeek.com/zach-myers-shinedown-guitar-rig-and-gear-setup-2011/), Zach Myers uses a Boss DC-2 pedal. According to [this interview with Reverb.com](https://reverb.com/news/drab-majesty-talks-chorus-pedals-casio-synths-and-the-selfless-act-of-songwriting), Andrew Clinco (alias DM) uses a DC-2. This highly collectible purple pedal features a very distinctive four button selection system that allows you to easily select between a few preset chorus, flanger, and leslie-type sounds. The effect parameters are fixed so there is no room for tweaking, but the stock sounds are pretty stunning. Button 1 is a mellow flange sound, buttons 2 and 3 offer up some smooth chorus sounds, and button 4 does a bubbly leslie simulation. If you're looking for wild and wobbly raygun sounds you may want to pass on this pedal as it's really all about subtlety. I can really see why so many Nashville session guitarists have these in their rigs. All the presets add a delicate shimmer without screaming "Look, I have my cool effect on now." The DC-2 is also used by quite a few atmospheric guitarists like Robin Guthrie of the Cocteau Twins and Billy Corgan of the Smashing Pumpkins. While the Dimension C stands alone perfectly fine on its own, adding a long delay and/or a washy reverb to the chain will create some of the most lush and slowly shifting ambient sounds you'll ever hear. The Dimension C is a beautiful (and rare) chorus that gives another dimension to your sound and brings it to the next level. I really dig mine : from lush to slowly shifting ambient sounds it does it all and well. beautiful lush chorus. No tinkering with knobs here, it's four options, and I just wish I had 4 of those pedals to have all of them available all the time.